Hello With Tacoma Party Rental you can rent your Carnival Time games, jump house, inflatables and concessions from us at Carnival Time. in Tacoma, Gig Harbor, Browns Point, Auburn, University Place, Puyallup, Dupont, Lakewood, Olympia, Washington. Operates the best carnival games, inflatables, concessions, and large party structures in the North West. We are literally everywhere in the North West, year round. Our carnival games can can stand up to your favorite quarterback(s) or softball pitcher(s). We come out, we setup the fun then we take it down when the party is over. We can also supply the manpower and tents to go with your dream occasion. The professional inflatables and tents we use are nothing short of wonderful and resilient. Hundreds of kids each year use our inflatables to enjoy their parties, so we maintain our inflatable wonderland to peak performance. Concessions are a wonderful way to get something back for your investment or maybe just feed the whole youth group. Regardless of your occasion, you'll rest easy knowing we got you covered from start to finish. 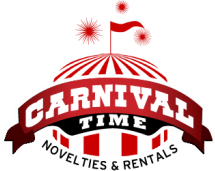 We saw Carnival Time Party Rentals Tacoma at the Enumclaw State Fair running a bunch of Jump Castle Party Rentals, and we wanted them to do our kids 3 year old party and our 6 year old's party. It went FANTASTIC! They were on time, on budget and super helpful. LOVE THEM!